Lately the book Bourbon Empire has been cited by more than a few articles I’ve read as debunking some of the bourbon mystique. “By the year 2000 you have 8 companies, 13 plants, and they make about 99 percent of all the whiskey in America,” the author Reid Mitenbuler told an astonished public radio reporter. That may be true (today the number is slightly less at around 95%) but it’s hardly new information to many informed drinkers that the overwhelming amount of bourbon is distilled by a handful of companies. In fact, with full knowledge of that, Willett Family Estate Bourbon is very sought-after by many extremely knowledgeable whiskey drinkers. The nose features vanilla and caramel, with a hint of clove spice. On the palate this bourbon is rich and complex with oak, dried fruit, toffee, buttery pie crust, banana, and fudge. The finish is surprisingly short with caramel and clove spice, although a tiny splash of water smooths out the dry spice. 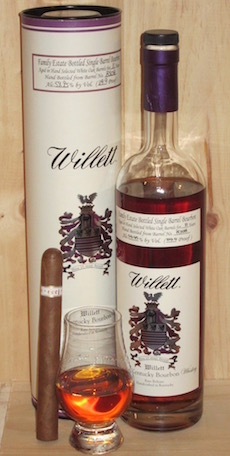 Willett Estate Bottled Single Barrel Bourbon is a testament to the fact that barrel management and selection are often more important than who distilled the whiskey. It’s an exceptionally rich and complex bourbon, which lets it live up to its expensive price. Still, the price leads me to recommend getting acquainted with better value bourbons before jumping up to this one. As for cigars, strangely, I don’t have any specific recommendations. This bourbon has complexity and strength, and also enough subtleties to go well with any good balanced cigar.